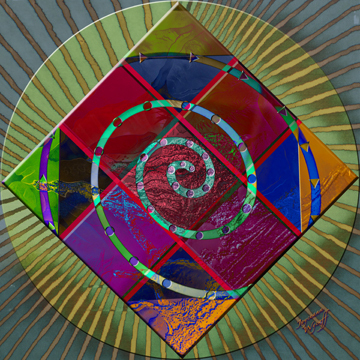 Yesterday, my artist friend, Kathleen Mattox, mentioned the 5 universal symbols (circle, square, triangle, equilateral cross, spiral) and, since it was my day to sit Timberline Art Gallery, I decided to take them as my art challenge for the day. It is a continuation of the series of abstracts I'm doing to stretch my art in a new direction. It is interesting to work with just color, shape and texture without focusing on a representational theme. I do a lot of work with blend modes in Photoshop and this series has allowed me to really focus on using the blend modes to get the effects I want. The blend modes provide a way to make layers interact with each other, sometimes in surprising and exciting ways. I especially like the "Difference" blend mode for its drama, but using it is like mirror drawing, everything is backwards. If you want green, you have to start with red; if you want dark, you have to start with light. Not only is it fun, there are some life lessons here. To get what you want, you have to understand how things work, and how they change when blended with something else. Anyway, here is the "Dance of the Universal Symbols" ... and, if you're interested in Photoshop blend modes, here is an excellent article. I especially like the effect of the square at the bottom; the orange and purple crackling gives the square a kind of texture.